Miss Brazelton registered for the Woman's Committee of Council of National Defense at Henry School, and the date was not entered. Her health is good, and she has indicated willingness to help at a camp or institution. 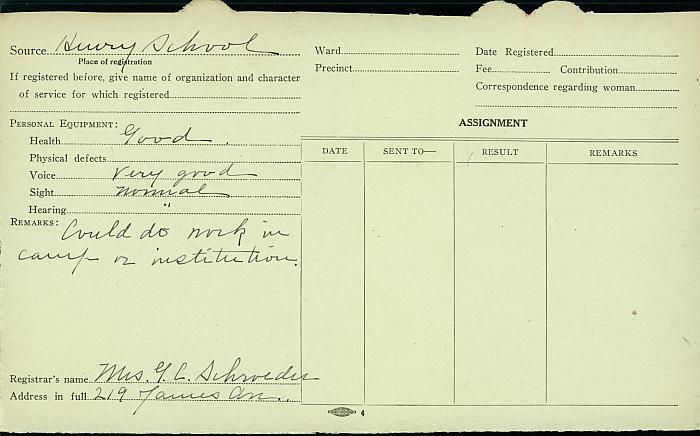 Mrs. Schroeder of James Ave. has recorded her information. Registration card 5 X 8 in. Title by cataloger. For more information view the Photo Essay on the Woman's Committee under Service.